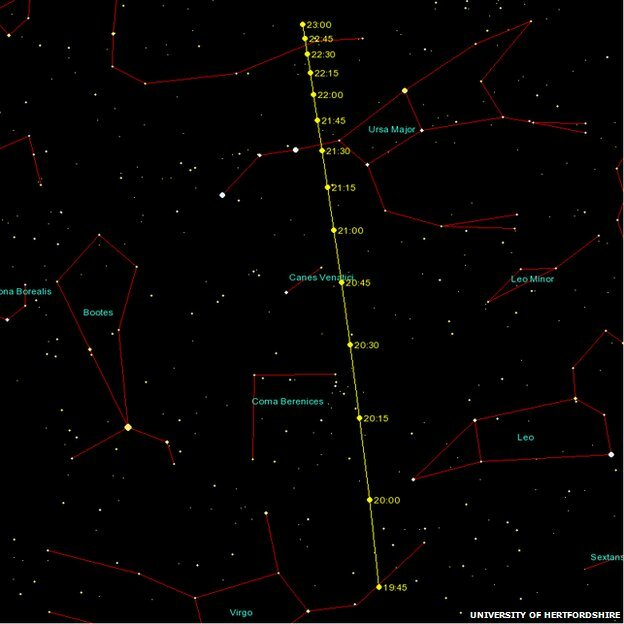 Discovered by the LaSagra observatory in southern Spain, the small asteroid 2012 DA14 will pass within about 3.5 Earth radii of the Earth's surface on February 15, 2013. Although its size is not well determined, this near-Earth asteroid is thought to be about 45 meters in diameter. 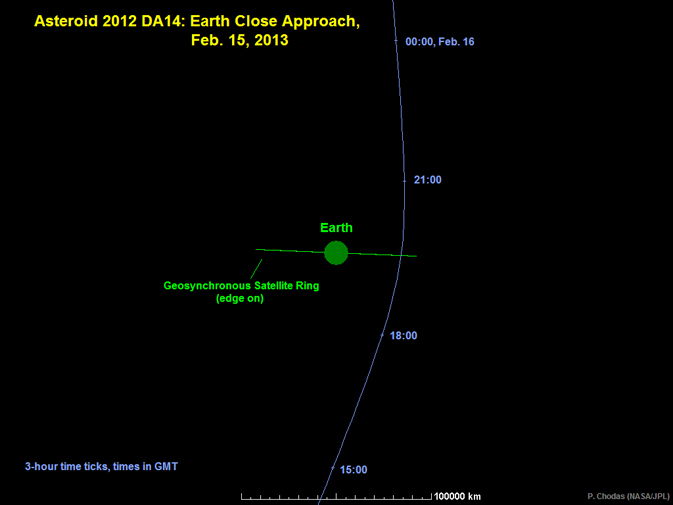 Asteroid 2012 DA14 will pass inside the geosynchronous satellite ring, located about 35,800 km above the equator. Its orbit about the sun can bring it no closer to the Earth's surface than 3.2 Earth radii on February 15, 2013. On this date, the asteroid will travel rapidly from the southern evening sky into the northern morning sky with its closest Earth approach occurring about 19:26 UTC when it will achieve a magnitude of less than seven, which is somewhat fainter than naked eye visibility. About 4 minutes after its Earth close approach, there is a good chance it will pass into the Earth's shadow for about 18 minutes or so before reappearing from the eclipse. When traveling rapidly into the northern morning sky, 2012 DA14 will quickly fade in brightness. Earth's neighborhood is littered with asteroids of all shapes and sizes, ranging from fragments smaller than beach balls to mountainous rocks many kilometers wide. Many of these objects hail from the asteroid belt, while others may be corpses of long-dead, burnt out comets. NASA's Near-Earth Object Program helps find and keep track of them, especially the ones that come close to our planet. The impact of a 50-meter asteroid is not cataclysmic--unless you happen to be underneath it. Yeomans points out that a similar-sized object formed the mile wide Meteor Crater in Arizona when it struck about 50,000 years ago. "That asteroid was made of iron," he says, "which made it an especially potent impactor." Also, in 1908, something about the size of 2012 DA14 exploded in the atmosphere above Siberia, leveling hundreds of square miles of forest. Researchers are still studying the "Tunguska Event" for clues to the impacting object. 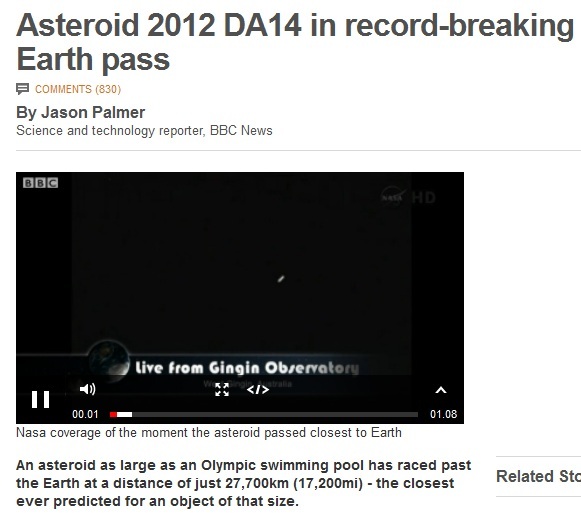 "2012 DA14 will definitely not hit Earth," emphasizes Yeomans. "The orbit of the asteroid is known well enough to rule out an impact." "The odds of an impact with a satellite are extremely remote," he says. Almost nothing orbits where DA14 will pass the Earth. NASA's Goldstone radar in the Mojave Desert is scheduled to ping 2012 DA14 almost every day from Feb. 16th through 20th. The echoes will not only pinpoint the orbit of the asteroid, allowing researchers to better predict future encounters, but also reveal physical characteristics such as size, spin, and reflectivity. A key outcome of the observing campaign will be a 3D radar map showing the space rock from all sides. During the hours around closest approach, the asteroid will brighten until it resembles a star of 8th magnitude. Theoretically, that's an easy target for backyard telescopes. The problem, points out Yeomans, is speed. "The asteroid will be racing across the sky, moving almost a full degree (or twice the width of a full Moon) every minute. That's going to be hard to track." Only the most experienced amateur astronomers are likely to succeed. Small near-Earth asteroid 2012 DA14 will pass very close to Earth on February 15, so close that it will pass inside the ring of geosynchronous weather and communications satellites. NASA's Near-Earth Object Program Office can accurately predict the asteroid's path with the observations obtained, and it is therefore known that there is no chance that the asteroid might be on a collision course with Earth. Nevertheless, the flyby will provide a unique opportunity for researchers to study a near-Earth object up close. Here are the facts about the safe flyby of Earth of asteroid 2012 DA14 -- a record close approach for a known object of this size. PASADENA, Calif. -- NASA Television will provide commentary starting at 2 p.m. EST (11 a.m. PST) on Friday, Feb. 15, during the close, but safe, flyby of a small near-Earth asteroid named 2012 DA14. NASA places a high priority on tracking asteroids and protecting our home planet from them. This flyby will provide a unique opportunity for researchers to study a near-Earth object up close. The half-hour broadcast from NASA's Jet Propulsion Laboratory (JPL) in Pasadena, Calif., will incorporate real-time animation to show the location of the asteroid in relation to Earth, along with live or near real-time views of the asteroid from observatories in Australia, weather permitting. At the time of its closest approach to Earth at approximately 2:25 p.m. EST (11:25 a.m. PST/ 19:25 UTC), the asteroid will be about 17,150 miles (27,600 kilometers) above Earth's surface. 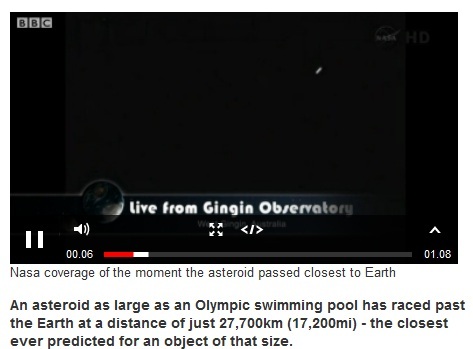 The commentary will be available via NASA TV and streamed live of NASA-TV. An asteroid as large as an Olympic swimming pool will race past the Earth on Friday at a distance of just 27,700km (17,200mi) - the closest ever predicted for an object of that size. It will pass closer even than the geosynchronous satellites that orbit the Earth, but there is no risk of impacts or collisions. Its closest approach will be 19:25 GMT. For regions in darkness around that time, it will be visible using good binoculars or a telescope. The asteroid's arrival was preceded by damaging meteor event in Russia on Friday - but indications from the meteor's path suggest that the two events are entirely unrelated - just a cosmic coincidence. The asteroid orbits the Sun in 368 days - a period similar to Earth's year - but it does not orbit in the same plane as the Earth. As it passes - at 7.8km/s (17,450 mi/hr) - it will come from "under" the Earth and return back toward the Sun from "above". It will pass over directly over the eastern Indian Ocean, making for the best viewing in Eastern Europe, Asia and Australia. But keen viewers anywhere can find one of several live streams of the event on the internet, including a feed from the Jet Propulsion Laboratory at Nasa, available from 19:00 GMT. 2012 DA14 was first spotted in February 2012 by astronomers at the La Sagra Sky Survey in Spain - once a fairly small-scale, amateur effort to discover and track asteroids that has in recent years become a significant contributor to our knowledge of these "near-Earth objects". They caught sight of the asteroid after its last pass, at a far greater distance. From their observations, they were able to calculate the asteroid's future and past paths and predict Friday's near-miss - which will be the closest the object comes for at least 30 years. Alan Fitzsimmons of Queens University Belfast said that it is a scientific opportunity not to be missed. "When asteroids come this close, it's very important to try to learn about them - it's become so bright, so it's so easy to study," he told BBC News. "We get an additional insight into these small objects, which are the most likely impactors on Earth." 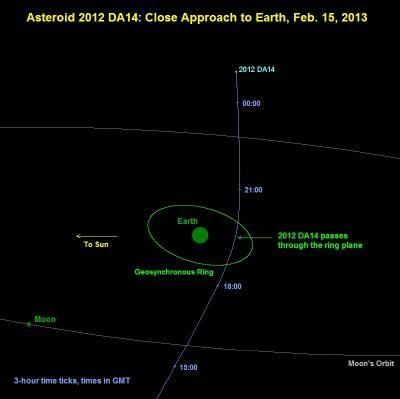 Like trailers for the coming attraction, new images show asteroid 2012 DA14 on its way to a record-close approach to Earth on Feb. 15. One image, taken by amateur astronomer Dave Herald of Murrumbateman, Australia, on Feb. 13, shows the asteroid as a tiny white dot in the field of view. 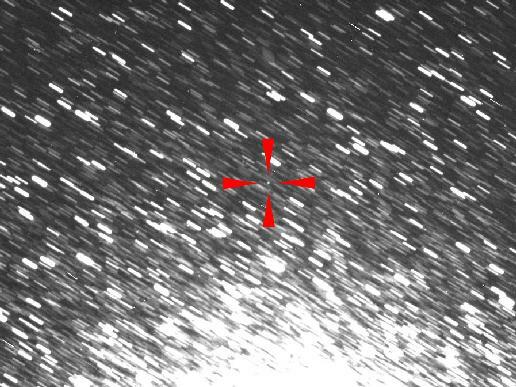 Another set of animated images, obtained by the Faulkes Telescope South in Siding Springs, Australia, on Feb. 14, and animated by the Remanzacco Observatory in Italy, shows the asteroid as a bright spot moving across the night sky. These are some of many images that may be taken of the asteroid during its close - but safe - encounter with Earth. It will be observed by numerous optical observatories worldwide in an attempt to determine its rough shape, spin rate and composition. NASA scientists will use NASA's Goldstone Solar System Radar, located in California's Mojave Desert, to take radar images of the asteroid to determine its precise size and shape on Feb. 16, 18, 19 and 20. The NASA Near Earth Object Observation (NEOO) Program will continue to track the asteroid and predict its future orbit. 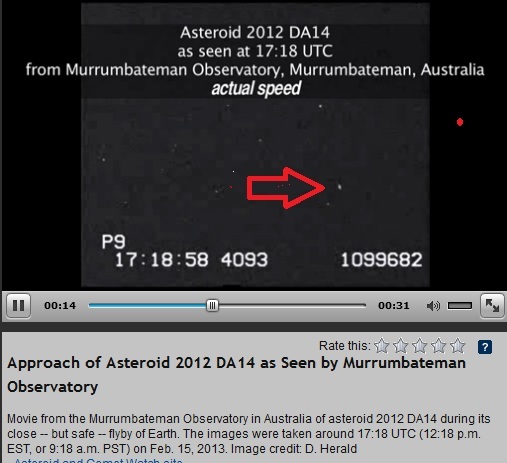 Asteroid 2012 DA14 is about 150 feet (45 meters) in diameter. It is expected to fly about 17,200 miles (27,000 kilometers) above Earth's surface at the time of closest approach, which is about 11:25 a.m. PST (2:25 p.m. EST) on Feb. 15. This distance is well away from Earth and the swarm of low Earth-orbiting satellites, including the International Space Station, but it is inside the belt of satellites in geostationary orbit (about 22,200 miles, or 35,800 kilometers, above Earth's surface.) 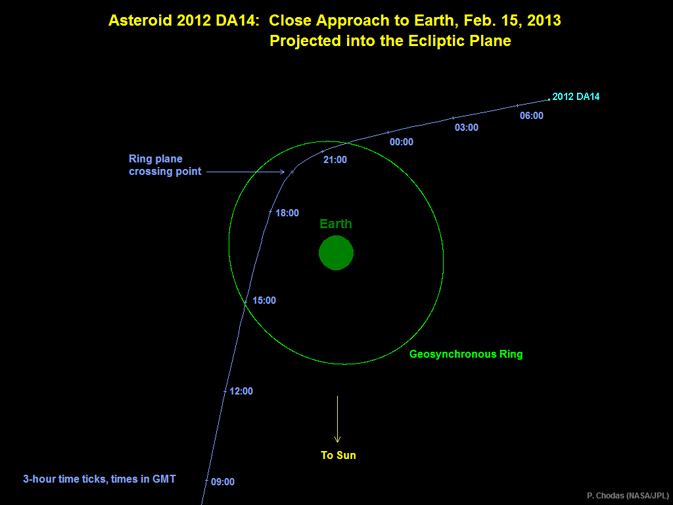 The flyby of 2012 DA14 is the closest-ever predicted approach to Earth for an object this large. The NASA Near Earth Object Observation (NEOO) Program detects and tracks asteroids and comets passing close to Earth using ground- and space-based telescopes. The network of projects supported by this program, commonly called "Spaceguard," discovers these objects, characterizes a subset of them and plots their orbits to determine if any could be potentially hazardous to our planet. The Near-Earth Object Program Office at JPL manages the technical and scientific activities for NASA's Near-Earth Object Observation Program of the Science Mission Directorate in Washington. JPL is a division of the California Institute of Technology in Pasadena. The NEOO Program Office performs more precise orbit determination on the objects, and predicts whether any will become an impact hazard to the Earth, or any other planet in the solar system. This image from D. Herald of Murrumbateman, Australia, shows the asteroid 2012 DA14 as a tiny speck in the center of the field of view. It was taken just past midnight on Feb. 13, 2013 in Australia (the morning of Feb. 12 in the U.S.), as it headed towards its closest approach to Earth on Feb. 15. The image is an overlay of 12 one-minute exposures. The asteroid is the small dot at the center, indicated by the red arrows. The white streaks are images of stars, trailed because the telescope was tracking the motion of the asteroid. At the time the image was taken, the asteroid was passing nearly in front of the globular cluster 47 Tucanae, located 17,000 light years away. The asteroid itself was only 770,000 miles (1.2 million kilometers) away, and closing in fast for its dramatic close approach on Feb. 15. At its closest, 2012 DA14 is expected to fly safely by the Earth at about 17,200 miles (27,700 kilometers) above the surface. This animated set of images, from the telescope known as the iTelescope.net Siding Spring Observatory, shows asteroid 2012 DA14 as the streak moving from left to right in the field of view. The images were taken around 9:40 a.m. PST (12:40 p.m. EST, or 17:40 UTC) on Feb. 15, 2013. 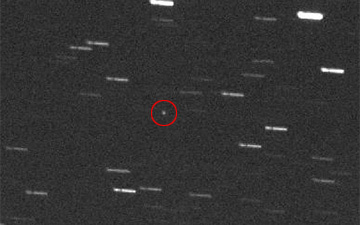 Farewell to a rocky visitor: asteroid 2012DA14 (the near-horizontal streak in the image) seen departing Earth around 23:45 CET after making closest approach at 20:27 CET on 15 February 2013. This image was acquired at ESA's Optical Ground Station (OGS) located on Tenerife, Spain.